Not impressing anyone with your weak handshake and soft paws? Here's how to look like Popeye. In his classic Encyclopedia of Modern Bodybuilding, Arnold Schwarzenegger shared a golden little gym nugget that I’ve taken to heart and used with my training since I was in high school. Arnold advised lifters not to use straps with pulling exercises, because you want your grip strength and forearm strength to progress along with your ability to pull big weights when you deadlift and perform lat exercises like bent rows, dumbbell rows and weighted pull-ups. After twenty years of playing contact sports, lifting and coaching, I’ve realized that Arnold was, and still is, absolutely correct. Sure, there’s a place for straps in your training - particularly when you’re deadlifting or rowing ridiculous amounts of weight like professional strongmen do - but most of us simply don’t train with heavy enough loads on these exercises to justify the use of straps and an avoidance of the benefits strap-free training will offer your forearm and grip development. I’ll tell you something else interesting. After twenty years, on and off, spent as a nightclub and bar bouncer in some of the biggest trouble spots in New York, I learned to watch out for guys with big forearms. Why? Because if everything else was equal - his ability to fight, state of inebriation, etc - the guy with the big forearms generally did something physical for a living and had a level of strength I needed to be wary of. If a guy with a good grip gets his hands on you, it’s definitely an advantage...for him. Having a decent grip can potentially be a deciding factor in just about any sport, too. Coming at this from a football perspective, how many times have you seen a tackle made where a defender simply “grabbed cloth,” hung on for dear life, and actually made a play? That happens every Friday, Saturday and Sunday on every football field in America. 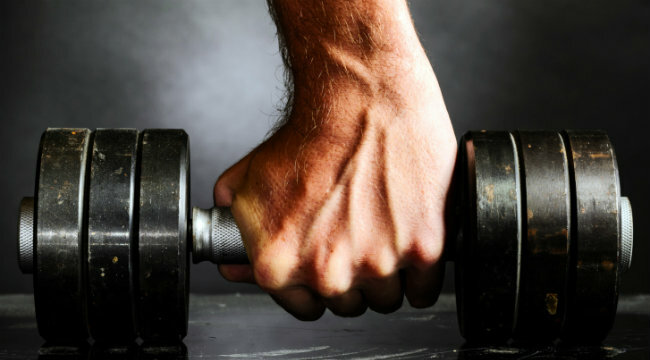 Baseball, lacrosse, hockey...with a few notable exceptions like soccer and running, you’re called upon to use your hands in virtually every sport, so paying attention to grip strength now will certainly pay dividends down the road.